Let’s start with the facts. No guy wants another tie. And no woman wants a gift card. What do you get for the boomer who has more than they need or want? Most of my friends are packing up their possessions and selling them on eBay, giving them away on Freecycle or donating them to local charities. But ‘tis the traditional gift-giving season. In addition to Hanukah and Christmas, I’m still attending milestone birthday parties. Since I hate to shop and am a terrible wrapper, I usually choose experiential gifts to mark these occasions. I’ll take a friend to dinner or give them concert tickets. There are so many great new bands out there playing in small, local venues; it’s an easy way to make a 50-year old feel twenty again. Or, if you know someone who’s longed for a bit of Indiana Jones-like adventure, how about the chance to play amateur archeologist? It’s a unique gift for person in your life who wants nothing. Adventures in Preservation (AiP) organizes volunteer vacations focused on the preservation of historic buildings that represent a region’s culture. I interviewed co-founder Jamie Donahoe and asked her about the appeal of AiP, its mission and programs. Other volunteer-driven agencies like Habitat for Humanity assist communities to provide safe and affordable housing. How does your mission differ? AiP’s primary difference from organizations like Habit for Humanity is our focus on preservation as a tool for good. The world has a great many challenges and we applaud all those agencies working to improve people’s lives. As the world changes, however, it is easy to lose sight of our heritage, and its inherent value, so we work to keep the focus on preserving it. There are many benefits of preserving and reusing existing buildings, such as keeping materials out of the waste stream; keeping traditional crafts and skills alive and creating jobs for people with those skills; and providing grounding and a sense of cultural identity within a community. Our intent is to preserve buildings so they continue to be used and form an integral part of community life, as they had historically, not simply save them as a museum or “attraction”. Working with historic buildings is the optimal type of short-term volunteer vacation. A great amount of progress can occur in as little as a week, so volunteers and community members can quickly see the benefits of their labor, and the next group can easily pick up and continue the work initiated. What is the appeal of this type of trip to those over 50? Will I be like the one old gal on “Survivor” who gets voted off the island on Day 1? I think the key thing driving the interest in volunteer or experiential travel is that many people—particularly those over 50—have already travelled extensively and are looking for something that goes a bit beyond the standard vacation. By this point in their lives, they know what is important to them personally and wish to allocate their professional experiences, finances and time in more meaningful ways. For people looking to really get to know a place rather than see seven countries in ten days, trips like ours are ideal. Our jammers are fully immersed in the history and culture of the site where they are working and living. Particularly at our European projects, it’s a wonderful way to understand all the elements that create cultural identity. In addition, every person involved in our volunteer preservation vacations acquires a new skill or newfound knowledge as a “take away” for their contribution of time and labor. With AiP the fun comes with a sense of accomplishment. As for the Survivor model, no one’s ever voted off the island! In fact, the mix of people at our projects is always cited as one of the key factors of their success, and we generally have people ranging in age from early twenties to mid-sixties. People at the upper end of the spectrum bring a wealth of practical, problem-solving experience with them and, luckily for us, they are willing to share that experience. The whole group benefits, as does the project. AiP projects in the heart of central Europe have raised the profile of heritage conservation in Slovenia and provided good times and great memories for their volunteers. Here, Judith Broeker, co-founder, center, with jammers from Australia. Do your volunteers require construction experience? On a scale of 1-10, what level of physical activity can volunteers expect? The beauty of our projects is that no experience is required, just an interest in history or culture, a sense of curiosity, and a willingness to pitch in and get your hands dirty. The scale is a bit difficult to measure, because for me, a day visiting museums and historic sites on foot is completely exhausting, though well worth doing. In fact, I find museums second only to shopping on the exhaustion scale, though neither are particularly “active”. So I would place our projects in the middle of the scale. It is not like climbing Kilimanjaro, but it’s certainly more active than lying on the beach. At each project, there are any number of different tasks to be done, so jammers can choose one most appropriate to their interest and ability. AiP and the Francis Mill Preservation have been working together since 2004. Here, volunteers place battens on new siding in the third year of active restoration work. Now fully restored to operating condition, it’s hard to believe it was on the verge of collapse ten years ago. You refer to your volunteers as “jammers”? Why? We actually struggled for a long time over this issue! We used a number of terms for the people who volunteered on our trips, but since our organization is staffed by volunteers, we needed a way to distinguish between organizational volunteers and project volunteers. “Participants” just didn’t sound engaged enough, and “team members” a little too corporate, so we held a brain storming session. During it, we recalled that when testing the name “Adventures in Preservation”, a couple of people said it evoked preserves or conserves, so in a not-so-logical-but-fun leap, we decided to call our project volunteers jammers, not only because of the jelly connection but also because of the way we all work together on a project site to create something, as musicians do when they jam. Do local residents work with the volunteers on the preservation project? Our goal is always to have local residents working alongside our volunteers, and that works very well in the US. Other countries have a different approach to volunteering, so in many cases, local residents who participate are doing so more to learn skills than to volunteer for a preservation project. In at least one instance, the manor house in Oplotnica, Slovenia, our project served as a major catalyst for conservation, inspiring the local community to pick up and complete the project. The overall effect was to significantly raise awareness of the value of historic buildings. What is the price and duration range for your planned 2014 adventures? AiP adventures are scheduled for one or two week sessions. Projects outside the US usually run for two weeks to give travelers an optimal heritage travel experience, but registration for one week is allowed. Prices are set for double occupancy lodging, with single supplement available. Fees cover lodging, most meals, excursions, training and materials. In 2018, our least expensive project continues to be Linking Archaeology with Preservation Using 3D Technology (Gloucester, VA) at $940 per week. In May, AiP has a remarkable project Saving Gyumri, Armenia’s Endangered Architectural Heritage priced at $1490, including a 3-day tour of the country. Our project at Dunans Castle in Scotland is $1580. Details of all projects are available on our website. 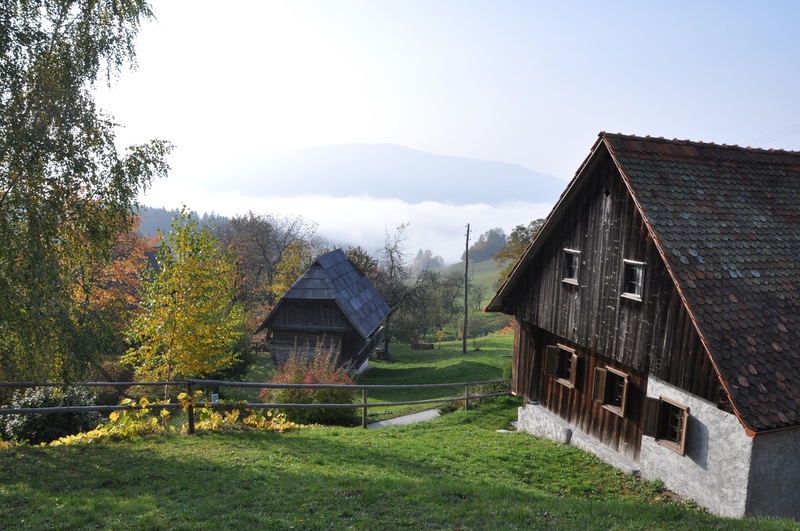 Stunning setting of AiP’s upcoming intergenerational project in Vitanje, Slovenia, which will incorporate woodworking, decorative painting and furniture repair into restoration work at the farmstead cottage. Wonderful idea, thank you! The Monastery in Vittorio Veneto is awfully tempting — will keep you posted!! I’ll need a guest post, if you go! Each December we get turned away as local volunteering opportunities get filled up too quickly. This looks like a nice way to combine our Christmas holiday away with hands on experience. Thanks for the great idea! You’re so very welcome. Let me know how it works out for you. Thanks for visiting.